This article has been written by Larissa Beumer and Åshild Ønsvik Pedersen. When we think about climate change, the Polar Regions are one of the first to come to our minds, with pictures of polar bears clinging to melting sea ice arising before our inner eye. Reindeer and caribou are inextricably linked to the Arctic, and they have shaped the culture and ensured the survival of Arctic peoples for millennia. Yet, it is only during Christmas time that they receive the attention they deserve – for all the wrong reasons. ‘Rudolph the red-nosed reindeer’ and his friends pulling Santa’s sleigh is no doubt a cute image, but contrary to some people’s beliefs, reindeer are no mythical creatures. They are magical due to their amazing adaptations to the harsh Arctic conditions and the important ecosystem services they deliver for the people of the North. But they are still for real – and so are the very fundamental and manifold challenges they face. Given their ecological and societal importance, and as wild reindeer populations all around the Arctic are declining[i], long-term monitoring and conservation efforts have to be intensified. Reindeer (Rangifer tarandus) – also called ‘caribou’ in North America – have a circumpolar distribution and can be distinguished into 7 sub-species. Spanning over 35° of latitude, their home ranges include Arctic and alpine open tundra landscapes and Sub-Arctic forests ‒ from the boreal taiga to the sparsely vegetated and barren grounds of the high Arctic. Except for some subspecies, reindeer and caribou are migratory animals that travel far between summer and winter ranges to follow the development of vegetation, avoid predators and to fulfil all stages of their annual reproduction cycle. The Alaskan Porcupine caribou herd holds the record for the longest documented migration of any land mammal: the females travel a minimum distance of about 5000 km per year. Amongst the hooved animals, reindeer are the most social ones, with most sub-species appearing in large herds that can consist of several thousand individuals. The biggest herds are found in North America and Russia. Reindeer behaviour, body characteristics and appearance have adapted to their specific environments over thousands of years. High weather variability poses extraordinary challenges throughout the year. They are uniquely fit to survive harsh winter conditions with deep snow, ice, wind and low temperatures, and outperform all other land animals in terms of energy efficiency in such climates. During the short summers, comparably high temperatures, moisture and insect harassment challenge the animals. It is normal for caribou and reindeer populations to vary largely in size over time and in different locations. These population fluctuations are influenced by many different factors, most importantly weather variability and extreme weather events, food limitation (especially when the herds grow too big), predation, hunting, insects and parasites, as well as diseases, competition between species, and human developments. In most cases, several of these factors act together and are difficult to differentiate. However, under current climate change, the environmental conditions reindeer are adapted to are changing fundamentally and rapidly. Simultaneously, they are faced with increased human infrastructure developments interrupting migration routes and fragmenting habitats. While maybe able to counteract and cope with some of these changes due to fast adaptations, others might pose existential threats for reindeer populations and herding cultures. Impacts of climate change on reindeer and caribou are manifold, and they can differ between subspecies, populations and seasons. While some effects might balance out others, they might also reinforce and add to each other. In the Arctic, where cold temperatures and precipitation falling as snow are supposed to be the normal for 8-9 months of the year, rainfall during winter is an extreme weather event. ‘Little understood killer in the North’ – this catchy headline chosen by Putkonen et al. [vi] captures well the magnitude of consequences such singular events can have. While difficult to study (the Arctic is vast, weather stations are few, and extreme weather events only occur sporadically and are thus difficult to capture), a growing amount of studies is beginning to show the impacts winter rain can have on Arctic flora[vii] and fauna[viii] as well as on human civilization[ix]. While such ‘rain-on-snow’ events also have occasionally occurred in the past, their frequency and intensity have increased. Models predict a further increase and by 2100 mid-winter temperatures in the high Arctic may be close to zero. [x] Winters in the Arctic are swiftly becoming warmer – and wetter. Reindeer are exceptionally adapted to deal with snow: their bodies are equipped with a sensitive nose to find vegetation under deep snow and hooves to dig through it to reach the vegetation underneath. But when it rains in winter during short periods of warm temperatures, ice layers can build up, either as crust on top of the snow, within the snowpack or – worst – covering the ground. If the latter happens, herders and researchers speak of ‘ice-locked’ pastures because it blocks the animals’ access to food under an ice layer just like bulletproof glass: impossible for reindeer to penetrate no matter how sharp their hooves. The effect of such extreme ‘rain-on-snow’ events depends on timing (does the ice build up early or late in winter? ), the amount of rain (how thick and continuous is the ice?) and the spatial scale (how large is the ice-covered area?). Especially in the high Arctic, where trees and shrubs are absent and vegetation is of very low stature, such events can have devastating effects on the populations of plant-eating animals. In bad cases, such extreme events can even lead to mass starvation of animals. For instance, in northern Canada, a severe ‘rain-on-snow’ event in October 2003 killed approximately 20.000 musk oxen, reducing the herd by about 25%. [xv] Similarly, in the north-west Russian low Arctic, two major rain events caused mass starvations of semi-domesticated reindeer on the Yamal Peninsula in November 2006 and 2013. This event caused severe ecological as well as long-lasting socio-economic impacts for the local reindeer herders. [xvi] Due to the 2013 event, with rainfall for ‘just’ 24 hours, 61,000 reindeer out of approximately 275,000 animals lost their lives – so far the region’s largest recorded mass die-off. The following summer, herders were ‘stranded’ on the tundra, as they did not have enough reindeer left to move their camps, and had to shift to full-time subsistence fishing instead. The process of rebuilding herds with the help of borrowed breeding stock takes several years. The recently-published study suggests a link between sea ice loss in the region (Barents and Kara Sea), more frequent and intense ‘rain-on-snow’ events and, as a consequence, high reindeer mortality. Such changes will thus also have profound implications for the future of nomadism of the Nenets people and other indigenous peoples depending on reindeer husbandry. Reindeer and caribou population numbers usually recover rather fast the year after a severe winter as there are fewer animals the following winter and thus less competition for food. Populations will most likely be able to recover from single events one winter, but the situation gets very difficult if the conditions prevail for many subsequent years – the more often it happens, the worse. Summers in the Arctic are short, but crucial for reindeer and caribou to replenish their fat reserves to survive the following winter and to reproduce. As typical for migratory ungulate species (i.e. animals with hooves), reindeer population dynamics are closely interlinked with the timing of plant development to make the best out of this narrow time window. Calving time in wild populations is highly synchronous and adjusted to coincide with the onset of summer, when the snow melts and new, highly nutritious plants emerge. One could assume that the prolongation of the growing season and increased primary production due to increasing temperatures in the Arctic will lead to an improved food availability for plant-eating animals. However, changes in timing could also create potential mismatches between the time when most plants with high nutritional values are available and the time when reindeer give birth to their calves, if the latter does not adjust accordingly. This could especially affect migrating populations: their movements to early summer calving grounds are typically initiated by changes in day length, whereas the onset of the plant growing season is cued by temperatures. For instance, such a mismatch is documented for migratory reindeer populations in West Greenland where it leads to reduced calf survival. [xvii] However, for semi-domestic, sub-Arctic populations in Northern Norway, rather positive effects of earlier spring onsets on calf autumn body masses and female reproductive success have been shown, indicating no negative impact from changes in phenology. [xviii] The potential impacts of such mismatches in timing can differ strongly between populations, and have to be assessed on a population-scale level. As the Arctic warms, insects also emerge earlier in the season and their abundance increases. 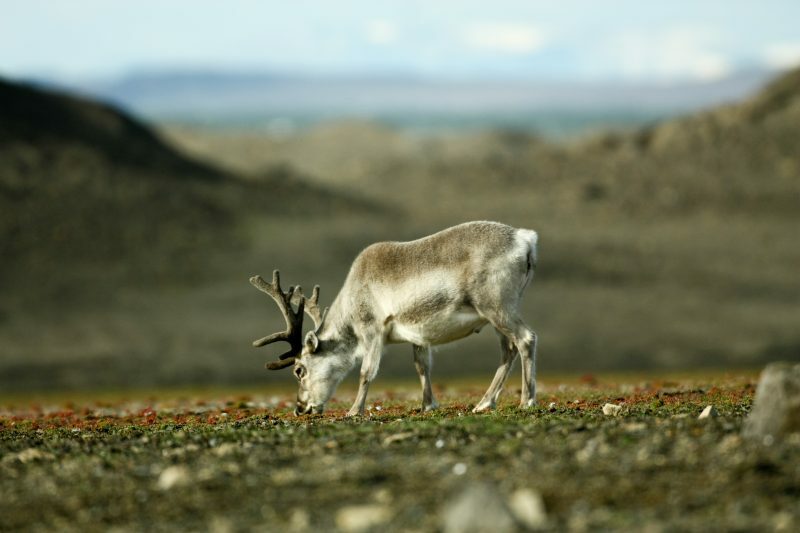 This reduces the time reindeer and caribou can spend foraging undisturbed and can result in negative impacts on body condition, and subsequently reproduction. Vast forested areas in the North are changing due to both forestry and climate change. Forests’ species composition and range are altered, and so is the often delicate balance between predators, their prey and their habitats. The frontier of the boreal forest, for example, is shifting northwards, leading to increased spatial overlap between moose and caribou on their winter ranges. Higher moose populations, in turn, support higher wolf populations than would be the case if caribou were the only primary prey species present for wolves to hunt. [xix] This may lead to an increased predation pressure for reindeer and caribou. When reindeer increasingly come in contact with other ungulate species, as distribution ranges shift, it will likely also increase disease and parasite transmission. And then there are the very random, almost bizarre – yet not less tragic – impacts of climate change: as for example this past summer, when melting permafrost lead to the first anthrax outbreak in Siberia since 1941. The outbreak killed a 12-year-old boy and more than 2,500 reindeer. The thawing permafrost soil had released the frozen bacteria, which commonly transmit through contaminated food and water. Wild and semi-domesticated populations throughout their distribution ranges increasingly compete for land with infrastructure developments of any sort, be it for oil and gas exploration, mining, roads, renewable energy projects or tourism. This adds to the effects on individuals and populations from global warming. In Norway, loss of pastures is the main challenge for reindeer herding. Even though oil and gas resources are found offshore, direct and indirect infrastructure developments on land fragment important Sami reindeer husbandry grazing areas (e.g. coastal summer pastures and calving grounds). Additionally, hydroelectric dams, power lines and the development of onshore wind power pose challenges. 78% of the coastal reindeer ranges in Northern Norway are expected to become severely disturbed by human developments by 2050. [xxi] The picture is similar in Russia: infrastructure developments are happening across grazing areas and migration routes, and while it is still possible to migrate through the industrialised areas, herders fear that infrastructure will become so dense that it will be physically impossible to pass through. [xxii] Indirect effects such as lack of access to fish, pollution of rivers and lands, introduction of new species and increasing numbers of visitors enhance the problem. In Alaska, the decade-long discussion about oil exploration in the Arctic National Wildlife Refuge is just another example of similar trends in North America: opponents are very concerned that opening the area to drilling and the associated infrastructure network of oil platforms, pipelines, roads and support facilities, would severely affect the calving grounds of the Porcupine caribou herd. The list of similar conflicts and projects with harmful impacts on caribou herds is long. Herders’ and hunters’ collective traditional knowledge and experiences are crucial resources for understanding climate change, but especially in strengthening their own social-ecological resilience to mitigate the effects. For instance, Nenets’ oral histories suggest that smaller, more flexible privately-owned herds could cope better than larger collectively-owned herds – a strategy that has also worked well in the face of infrastructure developments in the region. [xxiv] Also, more mobile slaughterhouses could help to buffer against reindeer starvation in case of icing events by reducing animals’ numbers. In addition, developing better ways of forecasting rain-on-snow events will be central, with just a few days of early warning potentially making a critical difference and giving herders sufficient time to prepare and act. [xxv] Such experiences and knowledge will enable adaptation to the ongoing changes and strengthen resilience. Integrating traditional and scientific knowledge, knowledge sharing, education and training are therefore key factors. While the cultural, socioeconomic and ecological significance of reindeer and caribou is essential, pressures on populations are mounting all over the Arctic. Populations have always strongly fluctuated in numbers. Thus, when assessing impacts of climate change, short-term fluctuations in population sizes must be considered with caution. However, it is the current synchronised declining population trends at the global level that are worrisome and important to address. In the face of the predicted climatic changes to occur in reindeer and caribou ranges, and the increasing disturbance by human activities in the North, it would be naïve to trust that this highly adapted species will simply ‘manage’. In addition to adaptive monitoring of populations and drivers of change, it will require long-term and well thought-through management solutions incorporating traditional knowledge that will minimise human landscape encroachment in their ranges and protection of core habitats to ensure populations’ long-term viability. Infrastructure developments must be based on intensive consultations with reindeer herders to better plan land use changes without fragmentation of important grazing areas and migration routes. It is our actions – both on the destructive and the protective side – that will shape the future of this iconic species and of the peoples that depend on it. [i] Vors, L.S. and Boyce, M.S. (2009). Global declines of caribou and reindeer. Global Change Biology, 15, 2626-2633. [ii] Killengreen, S.T., Lecomte, N., Ehrich, D., Schott, T., Yoccoz, N.G. and Ims, R.A. (2011). The importance of marine vs. human-induced subsidies in the maintenance of an expanding mesocarnivore in the Arctic tundra. Journal of Animal Ecology, 80, 1049-1060. [iii] Bass, R. (2004). Caribou Rising: Defeending the Porcupine Herd, Gwich-‘in Culture, and the Arctic National Wildlife Refuge. Sierra Club Books. [v] Turi, E.I. (2008). Living with climate variation and change: A comparative study of resilience embedded in the social organisation of reindeer pastoralism in Western Finnmark and Yamal Peninsula. Thesis. Institute of Political Science, University of Oslo. [vi] Putkonen, J., Grenfell, T.C., Rennert, K., Bitz, C., Jacobson, P. and Russel, D. (2009). Rain on snow: little understood killer in the North. EOS, 90, 221-222. [vii] e.g. Bjerke, J.W. (2011). Winter climate change: Ice encapsulation at mild subfreezing temperatures kills freeze-tolerant lichens. Environmental and Experimental Botany, 72, 404-408. [viii] Grenfell, T.C. and Putkonen, J. (2008). A method for the detection of the severe rain-on-snow event on Banks Island, October 2003, using passive microwave remote sensing. Water Resources Research, 44, W03425. Gilg, O., Sittler, B. and Hanski, I. (2009). Climate change and cyclic predator-prey population dynamics in the high Arctic. Global Change Biology, 15, 2634-2652. Hansen, B.B., Grøtan, V., Aanes, R., Sæther, B.-E., Stien, A., Fuglei, E., Ims, R.A., Yoccoz, N.G. and Pedersen, Å.Ø. (2013). Climate events synchronize the dynamics of a resident vertebrate community in the high Arctic. Science, 339, 313-315. [ix] Hansen, B.B., Isaksen, K., Benestad, R.E., Kohler, J., Pedersen, Å.Ø., Loe, L.E., Coulson, S.J., Larsen, J.O. and Varpe, Ø. (2014). Warmer and wetter winters: characteristics and implications of an extreme weather event in the High Arctic. Environmental Research Letters, 9, 114021. [x] Rennert, K.J., Roe, G., Putkonen, J. and Bitz, C.M. (2009). Soil thermal and ecological impacts of rain on snow events in the circumpolar Arctic. Journal of Climate, 22, 2302-2315. Hansen, B.B., Isaksen, K., Benestad, R.E., Kohler, J., Pedersen, Å.Ø., Loe, L.E., Coulson, S.J., Larsen, J.O. and Varpe, Ø. (2014). Warmer and wetter winters: characteristics and implications of an extreme weather event in the High Arctic. Environmental Research Letters, 9, 114021. [xi] Stien, A., Ims, R.A., Albon, S.D., Fuglei, E., Irvine, R.J., Ropstad, E., Halvorsen, O., Langvatn, R., Loe, L.E., Veiberg, V. and Yoccoz, N.G. (2012). Congruent responses to weather variability in high arctic herbivores. Biology Letters, doi: 10.1098/rsbl.2012.0764. [xiii] Kohler, J. and Aanes, R. (2004). Effect of winter snow and ground-icing on a Svalbard reindeer population: results of a simple snowpack model. Arctic, Antarctic, and Alpine Research, 36, 333-341. Hansen, B.B., Aanes, R., Herfindal, I., Kohler, J. and Sæther, B.-E. (2011). Climate, icing, and wild arctic reindeer: past relationships and future prospects. Ecology, 92, 1917-1923. [xiv] Hansen, B.B., Grøtan, V., Aanes, R., Sæther, B.-E., Stien, A., Fuglei, E., Ims, R.A., Yoccoz, N.G. and Pedersen, Å.Ø. (2013). Climate events synchronize the dynamics of a resident vertebrate community in the high Arctic. Science, 339, 313-315. [xv] Putkonen, J., Grenfell, T.C., Rennert, K., Bitz, C., Jacobson, P. and Russel, D. (2009). Rain on snow: little understood killer in the North. EOS, 90, 221-222. [xvi] Forbes, B.C., Kumpula, T., Meschtyb, N., Laptander, R., Macias-Fauria, M., Zetterberg, P., Verdonen, M., Skarin, A., Kim, K.-Y., Boisvert, L.N., Stroeve, J.C. and Bartsch, A. (2016). Sea ice, rain-on-snow and tundra reindeer nomadism in Arctic Russia. Biology Letters, 12, 20160466. [xvii] Post, E. and Forchhammer, M.C. (2008). Climate change reduces reproductive success of an Arctic herbivore through trophic mismatch. Philosophical Transactions of the Royal Society B, 363, 2367-2373. [xviii] Tveera, T., Stien, A., Bårdsen, B.-J. and Fauchald, P. (2013). Population densities, vegetation green-up, and plant productivity: Impacts on reproductive success and juvenile body mass in reindeer. PLOS ONE, 8, e56450. [xix] Ballard, W.B., Ayres, L.A., Krausman, P.R., Reed, D.J. and Fancy, S.G. (1997). Ecology of wolves in relation to a migratory caribou herd in northwest Alaska. Wildlife Monographs, 136, 3-47. Jensen, G.H., Madsen, J., Johnson, F.A. and Tamstorf, M.P. (2014). Snow conditions as an estimator of the breeding output in high-Arctic pink-footed geese Anser brachyrhynchus. Polar Biology, 37, 1-14. [xxiv] . Forbes, B.C. (2013). Cultural resilience of socialecological systems in the Nenets and Yamal-Nenets Autonomous Okrugs, Russia: a focus on reindeer nomads of the tundra. Ecology and Society, 18, 36. Åshild Ønsvik Pedersen is a Terrestrial Ecologist working at the Norwegian Polar Institute with a focus on reindeer population monitoring and ecology.